To date, Zupa Noma, which was created by Sonoma Brands, has been positioning itself as a player in the ready-to-drink soup category. This brand, which is positioned simply as a “Veggie Shot,” leaves the soup category behind and seeks to position the product as a quick hit of veggies that have been formulated with functionality in mind. 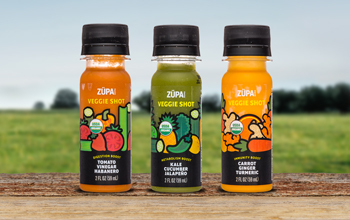 The product line includes three flavors: Kale Cucumber Jalapeno (“Metabolism boost”), Tomato Vinegar Habanero (“Digestion boost”), and Carrot Ginger Turmeric (“Immunity boost”). From a taste perspective, the three actually vary quite a bit. Tomato Vinegar Habanero has a tangy apple cider vinegar note that’s hard to miss, and you can also taste red bell pepper, onion, tomato, lime and cucumber. Noticeably absent is the habanero, which, for a product that features it as part of its name, was somewhat of a surprise. We’d love to see more heat in the finish of this product. Kale Cucumber Jalapeno, on the other hand, has a nice dose of jalapeno right off the bat. However, it’s not something that we’d describe as overly spicy -- the flavor is ultimately somewhat similar to a green juice but with more viscosity and less sweetness. 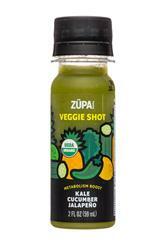 You’ll taste kale, cucumber, pepper, pineapple, tomatillo, and lemon before finishing up with a slightly salty note. While we can’t help but wonder if a little dash of apple cider vinegar wouldn’t make this better, this is our favorite of the three that we sampled. Lastly, there’s the Carrot Ginger Turmeric variety which, much like Kale Cucumber Jalapeno, has a somewhat juice-like flavor to it. Carrot, ginger, and turmeric are the flavors that you taste first and foremost, while lemon, apple, lemongrass, cayenne, and salt round things out. There’s something about the front part of it that tastes unbalanced, although we can’t quite put our finger on which ingredient or ingredients is behind it. As far as the packaging and branding are concerned, this product is one that seems like it could fit in with the juice shots as a savory offering. 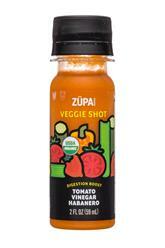 And the treatment of “Veggie Shot” does make the overall pitch and purpose pretty matter of fact. That being said, we’re not sold on the way that they’ve introduced functional “boost” callouts on the front panel as they don’t explain this anywhere else on the bottle. We wonder if using the space to either promote the flavor or a more loose nutritional benefit from the veggies might be better off. 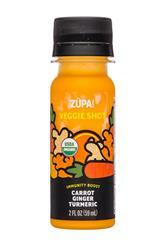 Overall, Zupa Noma has done a nice job with this lineup and we certainly see room for additional SKUs.